So, you’ve decided to move to the Grand Canyon State, joining the 7 million of us who already call Arizona home -- good choice. Maricopa County is boasting the highest growth rate in the country, and while you might have some concerns about temperatures reaching 120 degrees, the javelinas, and our abundance of spike-covered cacti, we’re here to assure that you’re going to love it here (as long as you don’t forget the sunscreen). To help you see the best of the best in Arizona, and to prepare you to be able to call yourself a true Arizonan, we’ve rounded up a list of 14 must-do and must-see items that’ll make you feel at home in no time. 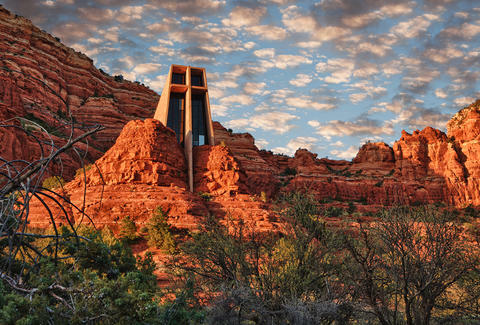 Anyone who calls Arizona home has to make it a priority to see the breathtaking red rocks of Sedona and take in the spiritual and healing vibes of the yoga-loving, crystal-covered city. And, while it’s touristy, the best (and most popular) way to explore the landscape is via Pink Jeep Tours, which have been delighting visitors and residents alike for nearly 60 years. Plus, there are several tours to choose from that explore spots like the mountain rim or ancient ruins -- so you won’t have to take the same trip over and over when you’re showing all your family and friends around your new state. Eating Mexican food should be at the top of any new Arizonan’s list of things to do, and fortunately the state’s second-largest city, Tucson, is home to the nation’s oldest Mexican restaurant in continuous operation by the same family, El Charro. The celebrated taqueria was opened in 1922 by Tia Monica Flin, whom the eatery claims invented the first chimichanga. Its staying power over the years is a testament to its popularity among locals; El Charro currently operates five locations in the Tucson area -- the US Navy even named the galley on the USS Tucson submarine after the restaurant. Order the carne seca, the dish that made them famous, and see what all the fuss is about yourself. Chris Bianco was slinging artisanal pies before it was cool. 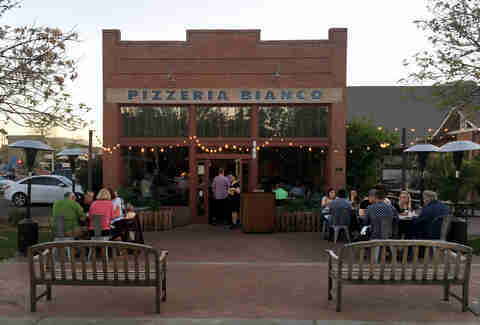 Pizzeria Bianco’s original location opened nearly 30 years ago (in a grocery store, no less) and has since earned him several culinary recognitions, including the 2003 James Beard Award for Best Chef: Southwest. The pizza is now celebrated nationwide and is still as popular as ever -- serving as the catalyst for a second location and three other concepts (Pane Bianco; Bar Bianco; and Tratto, Bianco’s newest, more upscale Italian restaurant). We recommend checking out the first downtown pizzeria and enjoying the simple yet classic margherita pie. Getting a sunburn while floating down the Salt River is a right of passage for any local. The uniquely Arizona activity is essentially a giant party on inner tubes in the middle of the desert, where people beat the heat with friends and throw marshmallows at other groups all the way down the river (it’s a whole thing). Besides bringing extra marshmallows for the aforementioned game, don’t forget a cooler with plenty of drinks -- hydration is important. If you’re lucky, you might also catch a glimpse of the mysterious and beloved Salt River wild horses during your float. 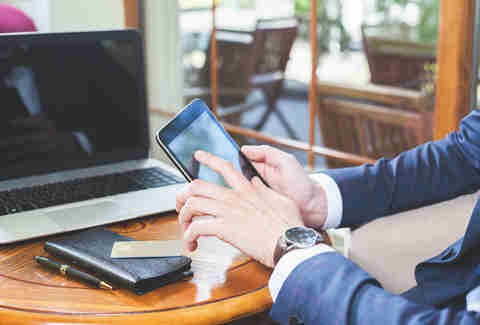 In need of a new bank to go with your new home? FirstBank has 15 branch locations in Arizona and dozens of ATMs throughout the state. Plus, when you open a new Anywhere Account and follow the qualifying steps, you’ll receive $300* to save for whatever you want -- like that mid-century modern coffee table you’ve had your eye on. *Certain requirements and restrictions apply. Member FDIC. The MIM has been ranked one of the top 20 museums in the US, and for good reason. 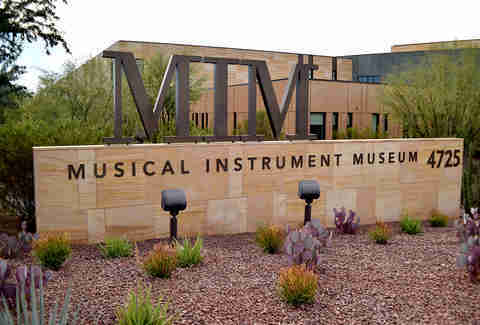 Not only is it beautiful and informative, it boasts the second-largest collection of musical instruments (more than 6,800) in the country. This isn’t your typical stuffy museum, either. In addition to galleries displaying the instruments, memorabilia, and costumes of pop icons like Taylor Swift and Johnny Cash, there are instruments to play, several interactive exhibits, a schedule of special events, and a concert series. Arizona is known for its golf -- from the flocks of retired golfers who call the Valley home, to the annual Waste Management Phoenix Open -- and it’s an integral part of the state’s appeal and culture. Top picks for hitting the links include the luxurious and internationally recognized Estancia Club as well as the prestigious and challenging Troon North, both in Scottsdale, but it’s hard to go wrong at any of the state’s nearly 200 golf destinations. The state also has approximately 3,600 holes to play, so the likelihood of you getting bored of the same old course is slim to none. Mastro’s is now an award-winning national brand, but its first-ever location opened in 1999 in North Scottsdale -- a quality brag for the Arizona dining scene. 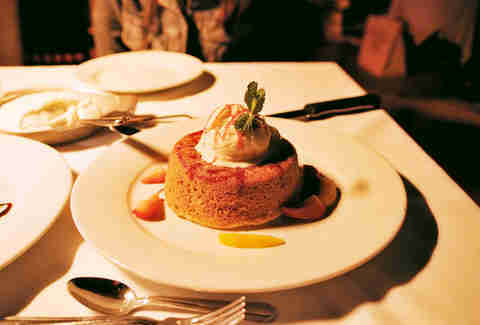 While the entire menu, especially the steaks, are drool-worthy, it’s the warm, decadent butter cake -- with its unequalled sweetness and decadent, fluffy texture -- that really sets this restaurant apart. It’s so beloved, in fact, that if you run out of things to talk about during a cocktail party full of Arizonans, just bring up how you’ve been meaning to try the Mastro’s butter cake and you’ll immediately have several new friends who will offer to accompany you for dinner (and talk your ear off throughout the whole meal about how great the cake will be). Arizona beer and Four Peaks Brewing Company are practically synonymous, which is especially notable in light of Arizona’s expanding presence in the brewery arena (celebrated newcomers include Tempe’s Pedal Haus Brewery and Phoenix’s Helio Basin Brewing). Four Peaks was founded in 1994, but its building actually out-dates Arizona’s statehood -- the brewery is housed in a former ice factory built back in 1892. It’s treasured for its creative and seasonal brews, but has made a lasting name for itself with classic favorites like the Kilt Lifter and Hop Knot IPA -- which we think taste best while taking a tour of the historic 8th Street location. Hiking is one of Arizona’s most beloved activities and an integral part of any active Phoenician’s social calendar. 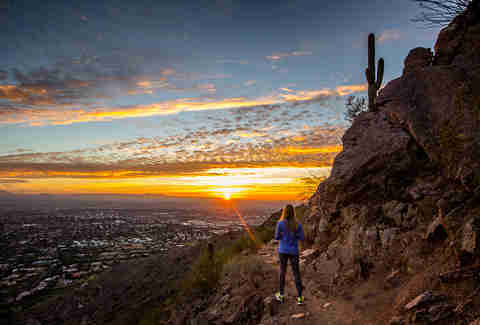 And the most famous hike in the state is Camelback Mountain, due to its iconic camel shape and high level of difficulty. Choose between the steep and challenging 1.2-mile Echo Canyon trail or the slightly longer, but less arduous 1.5-mile Cholla trail. Even if you’re not an experienced hiker, it’s worth checking out for the incredible views, though first-timers might consider taking a guided hike for the fullest, safest experience. Marquee Theatre has been bringing top musical artists like Adele and Modest Mouse to the Valley for 15 years, and even before rebranding to its current name, it operated as a family-oriented theater for a decade. The standing-room-only venue has undergone a lot of changes over the years, but its most recent renovation transformed it from dive-y auditorium to upscale concert hall, complete with a modern bar, luxurious finishings, and VIP seating. Combined with Marquee’s steady lineup of hit acts across all genres, this is a must-visit for any music lover. 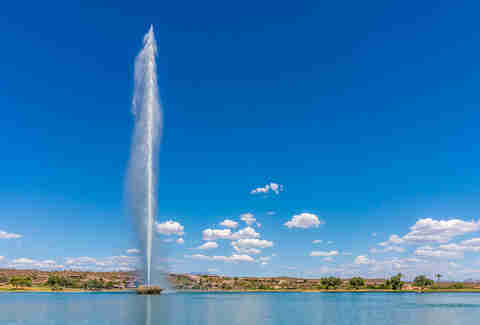 The Fountain Hills fountain is one of those strange sights that only seems to make sense in Arizona. There’s something especially impressive about a fountain that reaches a height of 330 feet, in the middle of the desert -- even if it is man made. The spray cranks up to 560 feet high on special occasions (like St. Patrick’s Day and Fourth of July), but it’s a captivating sight anytime, and it’s available for your viewing pleasure for 15 minutes every hour, on the hour, from 9am to 9pm every day. As the architect behind Arizona State University’s Gammage Auditorium and the David & Gladys Wright House (and a consultant on the Arizona Biltmore), Frank Lloyd Wright’s significance in Arizona can’t be overstated. And the now-iconic Taliesin West in Scottsdale served as his home, laboratory, and school -- making it one of his most personal creations. Fortunately, the property, which boasts an almost magical ambiance, is still an active space today, offering various guided, themed tours and hosting special events. 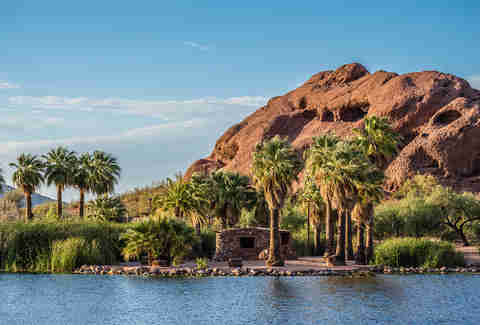 One of the first things you’ll learn about this state is that it’s beloved for its colorful sunsets, and one of the most quintessential ways to watch an Arizona sunset is by viewing it through the famous “Hole-in-the-Rock” at Papago Park, a naturally-formed opening in the red butte. In addition to its beauty, the park also holds historical significance -- it was the home of ancient Hohokam Indians, served as a prisoner camp during World War II, and some areas of the park are still used for Arizona National Guard training today. Seeing as Arizona’s nickname is the Grand Canyon State, this one pretty much goes without saying. The awe-inspiring site, formed by the Colorado River over millions of years, covers over 1.2 million acres of land and extends approximately 277 river miles, with the width and depth of the canyon varying depending on which rim you visit. That being said, the ways to explore the canyon are practically endless -- whether hiking eight miles to camp near Havasu Falls is your idea of a good time or you’d rather take in the views from above on a helicopter ride. Most locals make it a point to explore the canyon from a few different routes throughout their time in Arizona.